I hope I will live long enough to experience the time when computers will manage to send fragrances. It would be so nice to be able to share the scents of Giverny. 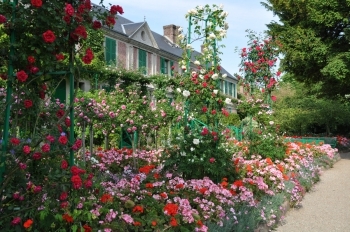 The roses are in full bloom, and their delicate perfume fills in the air. In the water garden, it mingles with the sweet scent of honey suckle, creating a very girly combination, the kind of fragrance I loved to wear as a teenager. I wonder if the teenagers of today still like it. But I see everyday how ladies love smelling flowers. To get most of a peony or an iris, the best is to put one’s nose in the petals. It is so good it gets addictive. Is this a feminine gesture, as a female visitor suggested it to me? I remember a photo of Georges Clemenceau smelling a rose. The Tiger himself! With such an example, gentlemen should feel free to indulge in this pleasure.